I often forget how good a creamy dressing on garden fresh greens can be. In our high-speed world, I usually make the speediest of vinaigrettes by simply sprinkling vinegar, oil and a pinch of Maldon salt on a plate a greens. No jar, no whisk, no spoon. Making a creamy dressing is so simple, I don’t know why I am not making them more often. Here are three variations on a creamy tarragon dressing. Don’t drown your salad greens in dressing: three teaspoons of dressing will serve two people nicely. Toss well to coat the greens. 1. Whisk all ingredients together in a small jar. 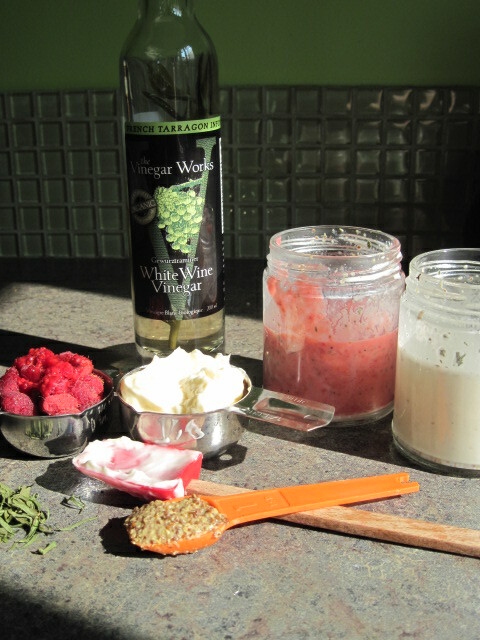 If using dried tarragon, let dressing sit for 1/2 hour before using to meld flavours. 1. Blend all ingredients either by hand or with your immersion blender. If using dried tarragon let sit for half an hour before serving to meld flavours. Less is More….the husband once again.